The global augmented reality (AR) and virtual reality (VR) market is expected to witness immense growth at a CAGR of 56.8% during the forecast period with its market size reaching USD 112.8 billion by 2024. The growth of the market is attributed towards increasing responsiveness about this technology among the consumers in both developed as well as developing an economy, rapid acceptance of AR and VR technology among various industry domains along with an amalgamation of AR and VR to develop mixed reality that can be implemented for prospective applications. Technological development, rapid growth in adoption of tablet computers and smartphones, excessive concentration of major tech players in the AR and VR system along with extensive mobility and versatility are the major factors attributed towards the growth of the global market. VR enables utilization of computer technology in order to develop a simulated environment. On the contrary, AR coats computer-generated developments over an existing reality that enhances interaction ability of this system. On the basis of component, the AR and VR market is segmented into hardware and software. The hardware segment accounts for the larger revenue in this segment of AR and VR market globally. Moreover, the software market is expected to witness faster growth during the forecast period attributed towards expanding demand from media and entertainment industry to meet the evolving needs of the consumers such as that of simulation games which are based out of AR technology. On the basis of device type, the AR and VR market is segmented into AR devices and VR devices. Among these two segments, AR devices are expected to witness faster growth during the forecast period owing to extensive demand for AR and VR technology from healthcare and retail domain in a developed economy that enables doctors and nurses to identify vein locations in patients. On the basis of application, the AR and VR market is segmented into AR applications and VR applications. AR application is segmented into consumer, commercial, aerospace and defense, enterprise, healthcare, and others. Of all, AR market size was largest for consumer applications. The VR application is also categorized into consumer, commercial, aerospace and defense, enterprise, healthcare, and others. Among all these segments, commercial applications accounted for the largest demand for VR solutions. Technological upgradation and AR and VR devices have led to the enlargement of visual experience to the users before making purchase decisions. For instance, there are several companies operating in developed economies that are providing a visual experience to its customers for example of furniture and accommodation of small spaces at their home through smartphones. Moreover, AR and VR technology is further accentuating the conventional museum experience for customers across the globe. Introduction of gaming consoles by major players such as Sony Corporation and Google, mobile applications and development of novice virtual and augmented reality-based devices are some of the major trends observed in AR and VR market across the globe. Moreover, easy and versatile utilization of these devices along with a high degree of mobility and flexibility are the key factors that are pertaining towards the growth of AR and VR market across the globe. The major factors that are driving the growth the AR and VR market includes excessive dissemination of tablets and smartphones among the population of various emerging, as well asthe emerged economy, is enabling a steady stage for AR and VR products. It has been observed that the AR and VR systems are becoming accessible to the consumers through various mediums such as platforms and devices. Furthermore, smartphones are extensively being utilized as input expedients for monitoring the VR situation, especially for the virtual reality gaming applications. Moreover, the increasing penetration of smartphones and tablet computers is extensively contributing towards the growth of AR and VR market across the globe. The tablet-based and mobile based AR and VR technology is observing rapid application form the key players operating in education, interior designing, e-commerce, architecture and furnishing. These factors are thereby attributing towards the rapid growth of AR and VR market globally. Progression of user-friendly VR systems along with alarming health concerns due to the use of AR and VR technology are the major factors that are hampering the growth of AR and VR market across the globe. Certain health concerns that are observed from the use of this system include motion sickness, eyestrain, and nausea that are usually drastic for health for a longer lifespan due to the prolonged effect on the eyes. Moreover, due to these health impacts, the demand for AR and VR technology is impacting in a negative manner. Globally industry players of global AR and VR market are leveraging market growth through mergers and acquisitions, technological developments and strategic developments. The rapid development of new products is thereby fueling the demand for AR and VR market globally. For instance, Samsung along with Oculus VR has recently developed virtual reality devices for extensive utilization of huge mass along with key smartphone players. These accomplishments are thereby exaggerating the growth of AR and VR market across the globe. Geographically, Asia-Pacific is expected to witness the fastest growth during the forecast period. The growth of this market is attributed towards increasing investment in defense and commercial domain in this region. The existence of a large number of display board industrialists along with technological enhancements are the key factors bolstering the growth of AR and VR market. Furthermore, accentuating growth in automotive and healthcare domain in a country such as Japan is expected to further drive the growth of AR and VR market in the near future. 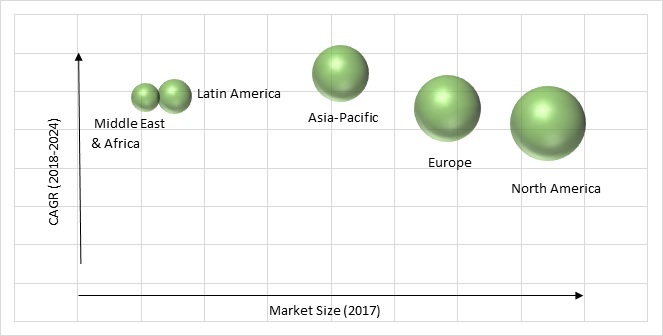 The market structure for global AR and VR market is fragmented and some of the key players operating in the AR and VR market across the globe include Alphabet Inc., Oculus VR, LLC, Microsoft Corporation, Qualcomm Technologies Inc., Intel Corporation, Himax Technologies Inc., Samsung Electronics Co. Ltd., PTC Inc. andSony Corporation. 11.7 Samsung Electronics Co. Ltd.
11.12. Osterhout Design Group (ODG) Inc.
Osterhout Design Group (ODG) Inc.